Dubai: Traffic congestion in Dubai is on a par with most major cities in the world, costing the economy Dh771,147.388 per kilometre in fuel and time lost, Gulf News can reveal. According to the Roads and Transport Authority (RTA), Dubai’s economy was set back by Dh2.9 billion in terms of loss in working hours, time and fuel in 2013. A simple division of the annual loss with the total length of roads in Dubai, which is 3,760.63 centreline kilometres, shows a loss of Dh771,147.388 per kilometre. 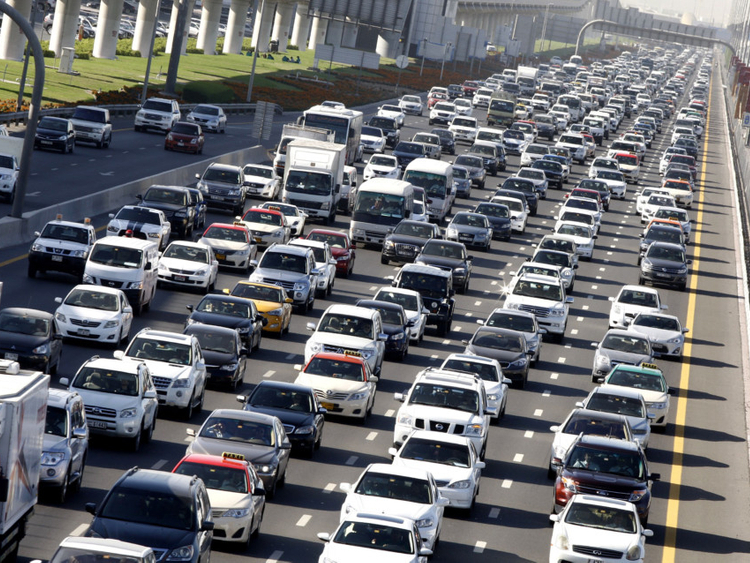 With 1.39 million vehicles registered in Dubai, the traffic cost per vehicle per year amounts to Dh2,086. However, the scenario would have been much worse if RTA had not developed the city’s infrastructure over the last nine years, spending up to Dh60 billion in building roads, establishing a Metro network and expanding other modes of public transport. Without the road and public transport projects implemented by RTA, the loss for the year 2013 alone would be Dh16.6 billion. In reality, the estimated cost of time and fuel lost in congestion from 2006 to 2013 was around Dh27.9 billion, owing to improved infrastructure. According to RTA’s calculations, without the road and public transport projects implemented by RTA, the sum of these losses within the same period would be around Dh100.4 billion. “What this means is that the RTA implemented road and public transport projects which saved around Dh72.53 billion. The approximate value of Dubai’s transportation assets is around Dh73 billion while the total capital expenditure made by RTA on road and public transport infrastructure between 2006 and 2013 was around Dh60 billion. So, the value of savings in time and fuel approximately balances the whole value of Dubai transportation assets’ value and is equivalent to around 120 per cent of the RTA’s total capital transportation expenditure made between 2006 and 2013,” said Nasser Abu Shehab, RTA’s Director of Strategic Transport Planning, speaking exclusively to Gulf News. This shows that though there are major losses to the economy due to congestion, significant investments in roads and transport infrastructure have managed to offset the effects of congestion to a great extent. In fact, RTA figures show that there have been benefits of decongestion to the community as well as the wider economy, which may not necessarily be in direct revenues. “International studies have shown that the ratio of total benefits [direct and indirect] to costs of transportation infrastructure and services can be as high as six to one. This indicates that every dirham spent on transportation infrastructure and services can yield up to six dirhams in the form of direct and indirect benefits,” said Abu Shehab. As a way forward, he emphasised, RTA will continue its efforts in the development of transportation infrastructure and services in future and will be spending in the range of Dh5 to Dh7 billion annually within the next few years for this purpose.